We are super excited to announce our Summer supper club in collaboration with Bristol Food Connections, a city-wide celebration of the vibrant food culture of Bristol, of which we are very proud to be part of! Catch us at The Watershed, our favourite independent cinema on June 15th, for a fine feast of locally sourced, summer eats and an exclusive candlelit gig from some of Bristol's finest. Click on 'Eat With Us' to book your tickets now! 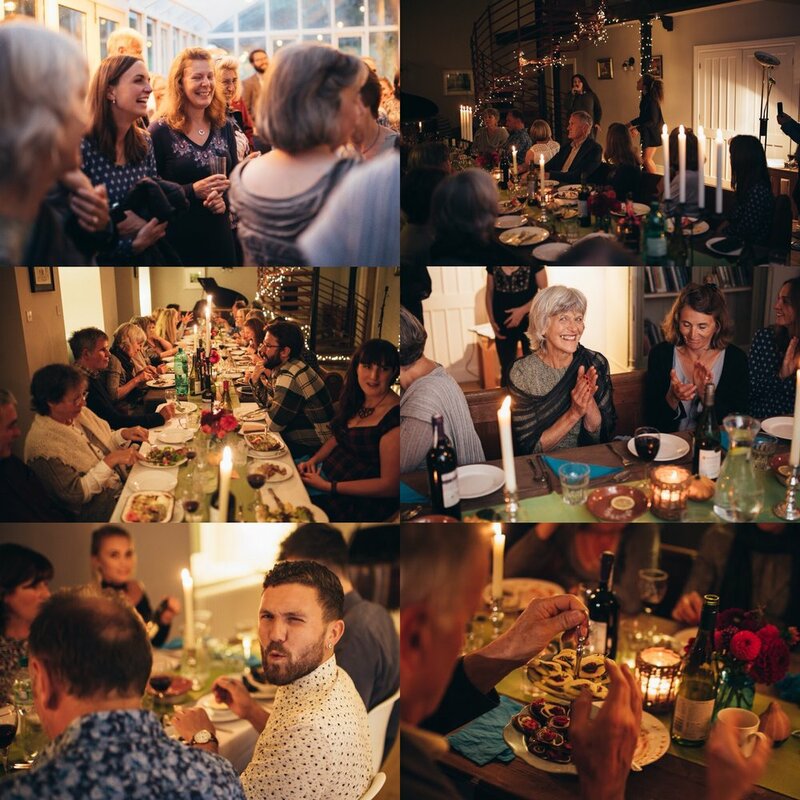 Homegrown Supper club is a pop-up restaurant and live gig produced by The Homegrown Collective; a family of musicians, cooks and food lovers who are passionate about bringing people together to celebrate the good things in life this Christmas. The feast will be made up of seasonal food that is produced locally, in healthy relationship with the soil. The music will be performed by a community of Bristol based artists, collaborating to share the most authentic, hilarious and heartwarming songs, acoustically, by candlelight and the venue is a stunning, ecologically renovated old building with the perfect amount of idyllic charm to hold such a culmination of creativity. The next event is going to be a special, seasonal extravaganza. Held at Dunkirk Mill, a self sustaining hydro-electric 19th Century mill-house near Bath, which, with its high ceilings, spiral staircase decked with Holly and Ivy and grand piano, will be the perfect setting, both visually and acoustically. The harmonies of The Homegrown Collective’s sing-a-long carols, as well as sets from Bristol’s New Quota and Samantha Lindo will be nestled in between the mulled wine on arrival and feast of seasonal ingredients. Think Kuri squash and ginger, honey braised parsnips and carrots, balsamic roasted beets with orange zest, slow cooked Stream Farm beef, toasted chestnuts, creamy potato and roast quince crumble with handcrafted chocolate and locally roasted coffee to wash it all down. Start the festive season as you mean to go on by helping us celebrate the things that are important. Find out how to source all of you Christmas ingredients locally and ethically from our partner farms, bring friends and loved ones as a special Christmas gift experience that builds relationship, creates memories and won’t end up in landfill and support more of what your want to see in 2018: local, small scale food producers, independent artists and people working together to do things differently! "It was as if you had cooked all the love and music in the room into the food, so that eating it was not only delicious, but just magical and up-lifting. "Thank you again - there was not a single moment from the first smiley welcome, through all the food and music, to the last hug goodbye, that wasn’t perfect." "Such a lovely evening - it was a great way to see friends and enjoy meeting others in a really relaxed environment. We loved the creativity, of food and music and ambience. It was all delicious and thank you so much for catering for special requirements too - very much appreciated." What a feast it was at Dunkirk Mill back in September. We were mid-harvest and enjoying the plentiful fruits of early autumn. Here is a rundown of the menu and all of the heroic, local food producers we are proud to be in partnership with. Starter: Mussels cooked in white wine, cream, caramalised shallots and chilli, slow cooked basil infused cherry tomatoes and 'Kelston Park' brie, baked with honey, hazelnuts, rosemary and garlic, all served with freshly baked multi-grain bread and butter. Sourced via Bristol Fish, on North Street in Bedminster, these mussels come from the river Exe; a special area of conservation and national & local nature reserve on the east coast of Devon. I was inspired to cook this favourite of mine, not only by my Breton cycling adventure this summer, when I ate the little creatures in various guises more times than remember, but also because they are one of the most sustainable, low impact sources of animal protein we have available to us. An important element of most of my french meals was the trusty onion, and this was also true for this dish. I sourced shallots from The Community Farm, an amazing community supported agriculture project based in Chew Magna. who aim to help people develop a better understanding of where their food comes from, reconnect with the land on which their food is grown, and learn more about sustainable farming. They also gave us some incredibly delicious cherry tomatoes, that were too small to sell, from their 'veg on the edge' waste reduction scheme. We transformed these perfectly wonderful little retail rejects into a slow cooked, basil infused sensation for the non meat-eaters among us. They supply veg boxes and wholesale all around Bath and Bristol, so look them up now and get yourself on the drop off list now! Served along side my favourite from The Bath Soft Cheese company, the organically produced, brie like 'Kelston Park', baked with honey, hazelnuts, rosemary and garlic, it was needless to say that starter went down an treat! You can get yourself some of this yummy, local stuff at the Bath farmer's market every Saturday or, like us, pop into their cafe in Kelston, meet the makers and have a lovely cup of tea while you're at it! No, not horse! Beef, and the best in country in my opinion! Stream Farm's award winning organic Dexter beef, topped with poached egg, parsley and caper sauce served with Bristols' edible futures salad and nasturtiums! As well as a medley of baked oeuf (free-range organic eggs) shitaki mushrooms, potatoes, parsley, chard, courgette, shallots and cream with Wife of Bath hard cheese. Served with the most beautiful multi-coloured beetroot grown by Flo at Dunkirk Mill, harvested myself and roasted with lots of butter, salt and pepper! Yum! Pudding: Breton style pear tart with salted caramel sauce, crème fraîche and crumbled raspberries! All of the delicious pears were grown at Dunkirk Mill, as well as the raspberries. The crème fraîche was supplied by Rhoddas, the trusty Cornish dairy we all want for our cream teas, plus butter from Yeo Valley; the Somerset family run organic farm that now is available in most good food shops. Thanks to Wags, who did most of the perilous pear harvesting us a rickety ladder. The next day, the lovely neighbour presented a specially designed, long reaching, pear picking gadget for the next time! What an abundant and beautiful month to host a supper club. The menu was brimming with seasonal specials from local producers and was a true, Portuguese inspired feast. Take a look at the menu for ideas to make at at home and peruse all the information on how you can source from the host local of producers we featured. Starter: Courgette and buckwheat muffinattas with beetroot tzatziki, spring onion and Bath Blue. Plowright Organics: Stowy Rock Farm - Bridgewater. Somereset grown and packed organic produce, delivered into Bristol for free every Wednesday. You can order easily online and you can choose exactly what you'd like in your box. The Bath Soft Cheese Co: Award-winning organic cheese made by hand at Park Farm, Kelston near Bath with milk from their own cows. Edible Futures: Edible Futures is a Bristol based growing project that is working to create a resilient food system. With community groups and local residents we are planting edible public gardens that will provide food for Bristol communities. There are weekly salad drops around Bristol including at Jubilee House on a Tuesday. Main: Stream Farm pulled pork with local honey, Somerset cider chorizo and UK grown fava beans, served in a white cob bread bowl with Portuguese potatoes, a seasonal slaw and edible futures leaves. Stream Farm: An organic farm in the Somerset Quantock hills, using a shared farming model to focus on rural regeneration and help people learn skills in sustainable farming. Produces chicken, smoked & fresh trout, beef, pork, lamb, apple juice and honey. Delivers for free into Bristol on Wednesdays and has a stall at Whiteladies Road market every Saturday. Click here to listen to when Radio 4 took a tour around the farm for 'On Your Farm'. Somerset Charcuterie: Somerset Charcuterie believe in embracing traditional Italian and Spanish methods combined with some of the fantastic flavours and rich food culture of the West Country, using mainly Saddleback, Oxford Sandy & Black or Tamworth pigs - all outdoor and locally reared. Available at local independent markets and online. Hodmedods: A small but growing independent business, founded in 2012 to source and supply beans and other products from British farms. They offer a wide range of British beans and peas, as well as some of the first British-grown quinoa. As well as their dried beans, peas and quinoa for cooking they have a growing range of ready-to-use canned beans and peas and also roast beans and peas to create very moreish ready-to-eat snacks. Order from the website or source from Earthbound in Cotham. Desert: Pastéis De Nata with foraged cherry and port compote and crème fraîche. Jess's Ladies Organic Farm Milk: Jess's family have been farming at Hardwicke Farm in gorgeous Gloucestershire for 3 generations, always looking after the land and the wildlife whilst producing the highest quality organic pastures for our herd of 80 beautiful cows. Available to order through Model Farm at Easton Food Assembly, a network of communities buying fresh food directly from local producers and farmers. Glebe Farm Eggs from Pitney Farm Shop: Farming 90 acres of organic mixed livestock and arable land and in summer animals graze on 40 acres of lush pasture on the Somerset Levels. It has been farmed by the Walrond family for over 200 years with three generations involved on the farm today. Available and delivered through Plowright Organics. Falling Fruit: A massive, collaborative map of the urban harvest uniting the efforts of foragers, freegans, and foresters around the world. Available as an App on your phone and as a website. Get it now before the harvest. Triple Co Roast: Triple Co Roast is an open access micro-roastery in the heart of the city of Bristol. It was founded by local Bristol boy Jo Thompson in early 2015 after he spent two years studying out in California, learning coffee and roasting at home. The mission is triple and always has been. To roast high quality coffee beans, small batch. To buy green coffee via direct trade with bean farmers and to focus on having amazing roaster-to-customer relations. They are also open-access and transparent, meaning you can go and visit and ask questions! For the vegetarian option we served up the same rich, bean packed stew, with the addition of roast squash and herb infused baked portobello mushroom with greek yogurt. And the dairy free pudding was a dish of organic cheeries with a pot of soya cream and port coolie. Yum! Campbell Sibthorpe: See him at The Arts House, Bristol on the 26th of July. Listen to him on Soundcloud and follow him on facebook for more live dates. Samantha Lindo: Catch her at Canteen on the 16th of July, follow her on Spotify to hear more music and like the facebook page for up-coming gigs. Jubilee Pottery: Resident potter Will Campbell-Clause uses earthenware clay and a selection of beautiful glazes to make a range of useful products for use at home, and in cafes and restaurants. Charlotte Ferreira: You all met Charlotte who's a bit Portugeuse, well she is a full London based upholsterer, specialising in traditional and modern furniture reupholstery. Fancy an evening jaunt to the countryside? Well, Homegrown Supper Club is getting rural! Welcome to Dunkirk Mill; an self-sufficient, 18th Century mill house, surrounded with an organic kitchen garden and stream fed mill pond, in Freshford, Bath, just a 30 min direct train away from Bristol. Our September Supper Club will be hosted here on Saturday 9th of September, in partnership with Wags and Fiona Firmin (my legendary aunty and uncle). Wags renovated the Mill, turning it into a hydro-electric powered dream and with her gift of gardening, Flo will be growing all of the vegetables and fruit for the meal, on site, in the kitchen garden. Picture log burning fires, spiral stair-cases and grand pianos and you'll be well on your way. We can't wait to host you here, so get your tickets now to reserve your place at the table! We're gearing up for the Summer Supper Club Special on the 7th of July, which will feature a locally sourced Portuguese inspired menu, including these traditional 'Papo Secos'; gorgeous, white, crusty rolls made the wonderful young mothers I work with at The Meriton Centre for Education and Support for Young Parents. Traditionally, these little beauties are used to make sandwiches, dip in olive oil and to mop up stews; at the supper club they will take their place beside the fava bean and chorizo medley to soak up all the rich goodness of the casserole. While the kids were in the the nursery and lessons had finished, the girls and I practiced creating the distinct shape of these famous crusty rolls; followed by a communal feast with some gorgeous butter from Ivy House Farm. We all stood round scoffing these amazingly crusty-yet-soft rolls with lashing of butter, chatting about food and laughing. Heaven! Here you can see one of the girls perfectly creating the distinct 'lip' shape that is unique to these traditional crusty delights. To come to sample the girls amazing handy work on the 7th of July, book your tickets now! Spring is just about my favourite time of year. The new life is so exciting and hopeful, and harvesting wild garlic in the woodlands is a sure sign it has arrived. Combine an Easter weekend walk with some easy wild-food foraging to make this perfect bank-holiday lunch! This was the starter at our April Supper club and I took my 8 year old God-daughter to help me harvest. She loved the smell and couldn't believe the garlic was going straight from the forest floor and into our food and was indeed, free! We were flavouring our meal using no packaging or air miles - just the abundance that we had around us. We went to Freshford, a village near Bath to pick ours, however National Trust have kindly put together a list of sites all over the country where wild garlic grows: you can walk and harvest at the same time, making it a prefect bank holiday activity for young and old. This recipe is topped with a nettle and parsley salsa verde. But what I also do, is make up a big batch of wild garlic pesto, then freeze it into ice cubes, pop them into a zip-bag and use them throughout the year to add to pizzas, risottos, pasta, omelettes, scrambled eggs, salad dressings and you name it to add that green, garlicky, goodness all year round! With scissors, harvest the leaves, stems and flowers. Try to take from different patches rather than all the same place. Dogs and birds tend to do what they do in the woods, so once home, wash the leaves thoroughly, at least two or three times. Pick off a few flowers to use as garnish later. Go for the small, young leaves at the top of the plant as they are less fibrous. Don't do what I did and try to use my hoodie sleeve for protection on an spontaneous mid-run harvest - you will get stung. Take gloves and a bag and you'll be laughing in the face of those nasty nettles! This is a chive-like, wild onion that you can only find in the Avon Gorge area, in the UK, hence nicknamed the Bristol onion. It grows in clumps on grassy banks and looks almost identical to chives. If in doubt, pull a sprig up and have a taste, you'll know if you've found some. 50g fresh ewes cheese to top or any type of local organic soft cheese. I used Homewood Farm. Pre-heat the oven to 180 °C and grease and line a bread tin with grease proof paper. Wash and chop the potatoes, then part boil them in salted water. In a mixing bowl, whisk the eggs, add the wild garlic and season with salt and pepper. Drain and add the potatoes to the egg mix. Pour into the prepared tin and sprinkle with pepper. Bake for 35 - 40 minutes until golden and solid, checking regularly. Turn tin up-side down to remove frittata. Leave to cool or cut when hot if you're eating it straight away. Make this as near to serving as possible as nettles go brown when left. Placed washed nettles in a pan with a tiny amount of water and olive oil and heat for a couple of minutes until soft. Place in food blender (I used a nutri-bullet) with the parsley, wild garlic, olive oil, salt and pepper. Whiz up and check consistency. Add more oil to make more runny if needed and agave or maple to taste. Keep in the fridge in a sealed container until serving. Place on plates, warm or cold. Dollop a table spoon of ewes cheese on top. Drizzle the salsa verde over the frittata and make three bold streaks on the plate for dramatic effect! Stick a wild garlic flower in the top, with chopped Bristol onion or chives and voila! There you have it, a light spring lunch that uses the green goodness of the land around you. Tickets are on sale for our summer supper club dates now for more homegrown inspiration, as well as live music, candlelit conversation and lots of love! This April's supper club was a celebration of spring! We'll be releasing the recipes throughout the coming week, so you can try them at home, but right now, here's a list of the lovely featured producers we waxed lyrical about on the evening. All of the veg on the night came from Plowright Organic. Browse their online shop, explore tailored veg boxes and read about the bio-diversity on the farm in the 'latest news' section. They deliver for free on a Wednesday and do more than just veg. The yummy, creamy, flavoursome cheese on top of your frittata was Fresh Ewe's Cheese from Homewood Farm. Based in Ubley in the beautiful Chew Valley, just south of Bristol, they make their cheeses by hand with ewes milk from two Somerset flocks. You can also find them every Saturday at Bath Farmer's Market and the first Sunday of the month at the Frome Independent. Essential Trading is a Bristol based workers co-operative that specialises in supplying organic, GMO free, fair trade, vegetarian and vegan wholefoods to the independent trade sector in the UK and abroad. Information about buying groups can be found on the link above, with a full catalogue of all their amazingly ethical products. Extraordinary Artisan Beer from a Bristol Brewing Company. This is just around the corner from Jubilee House in St Werburghs. We used the Blossom Ale that is the current seasonal brew, but you can try their many delicious beers in pubs, bars & retailers around Bristol and Bath, all listed on the Wiper & True site. Information and links to our long term partners Stream Farm and Edible Futures can be found in the 'About Us' section. The candlelit, un-amplified, intimate musical performances at Homegrown Supper Clubs are a big part of what makes them such special evenings.